Each year in Britain, there are thousands of people dying of lung disease or being diagnosed with asthma as a result of airborne contaminants breathed in in the workplace. Any workplace which produces dust, mist, fumes, gases or vapours may be risking the health of its employees, examples include flour dust in bakeries, paint mist from spraying, carbon monoxide from furnaces and solvents from painting. 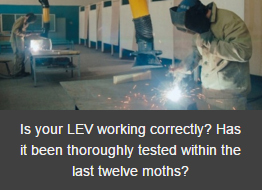 The law states that you must ensure that an LEV system continues to work properly once installed and as such, must be regularly tested and maintained. This work must be done by a competent person. The frequency of LEV testing is dependent on how complicated the system is, how likely it is to fail and the likely consequences of failure (risk). A record of all LEV checks and maintenance must be kept on site for at least five years. COSHH Regulations require more frequent testing for some processes.